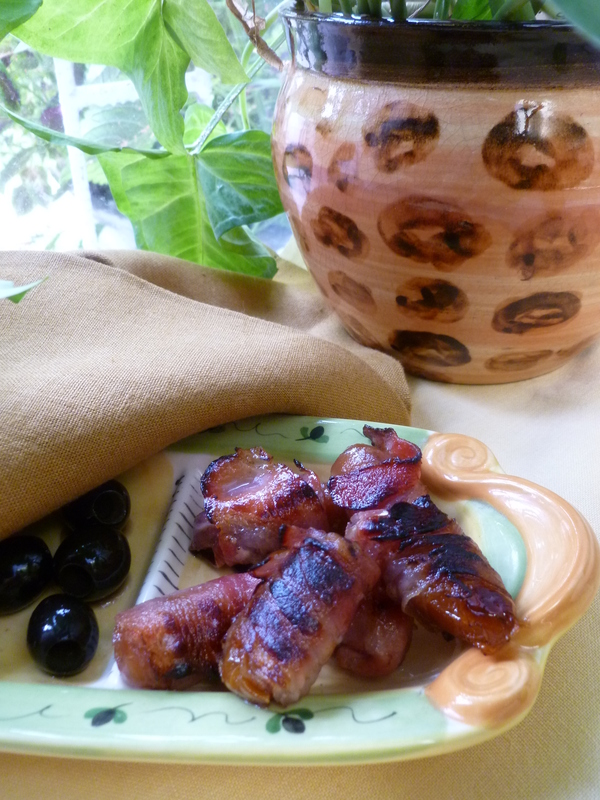 What little else there is to to add to these few lines on how to make Bacon-wrapped Dates is briefly described below. 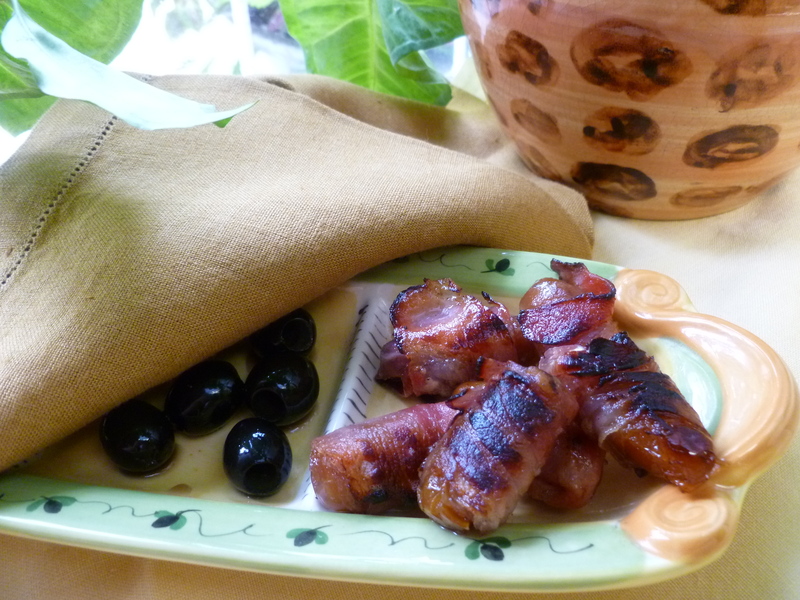 Dates and bacon are an agreeable sweet and salty combination. In the diplomatickitchen’s Occasional Menu, Blunting the Keen Tooth of Winter: A Supper Party following an Out-of-doors Afternoon, these dates are served with Rosemary Walnuts, which is in accordance with a tradition that has lasted because the pairing of walnuts with dates is another naturally good one. about 6 strips of European Breakfast Bacon, or 3 long strips of American Bacon, preferably thin-sliced: European Breakfast Bacon is very thin and is especially good for making these dates, but any bacon will be fine. 1. If using European Breakfast Bacon, cut each slice lengthwise into 2 strips. (A strip of it is shorter than a strip of American Breakfast Bacon). If you are using strips of American bacon, cut each strip in half lengthwise and cut each half crosswise to form 4 strips. 2. 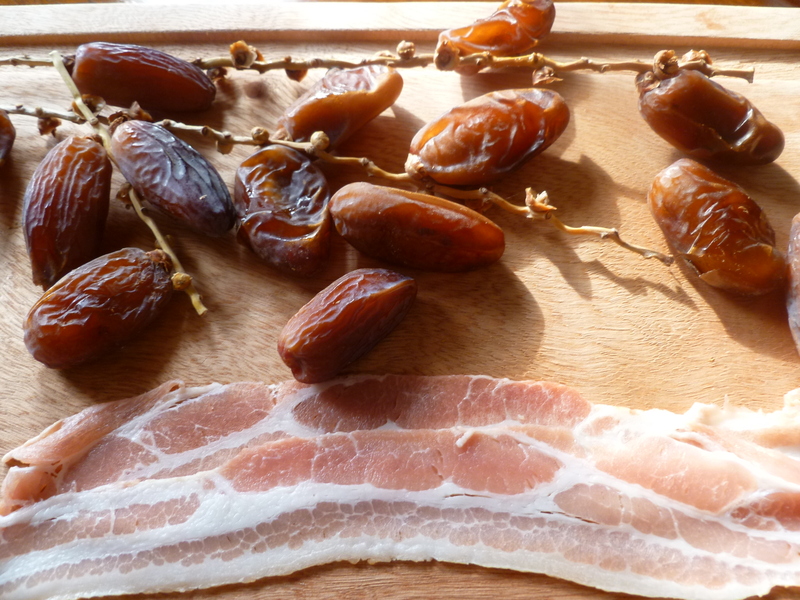 Starting at one end of a date, wind a strip of bacon around it so that only the two ends of the date are visible. Smooth the bacon around the date as you wind it so that it hugs the shape of the date. Wind strips of bacon around all the dates. 3. Heat a little oil in the pan over medium heat and add the dates. Sauté them gently and not too quickly, turning them with the help of two forks, so that the bacon crisps slowly all around the date. The bacon will fasten itself around the date as it crisps rather than coming away from it. 4. 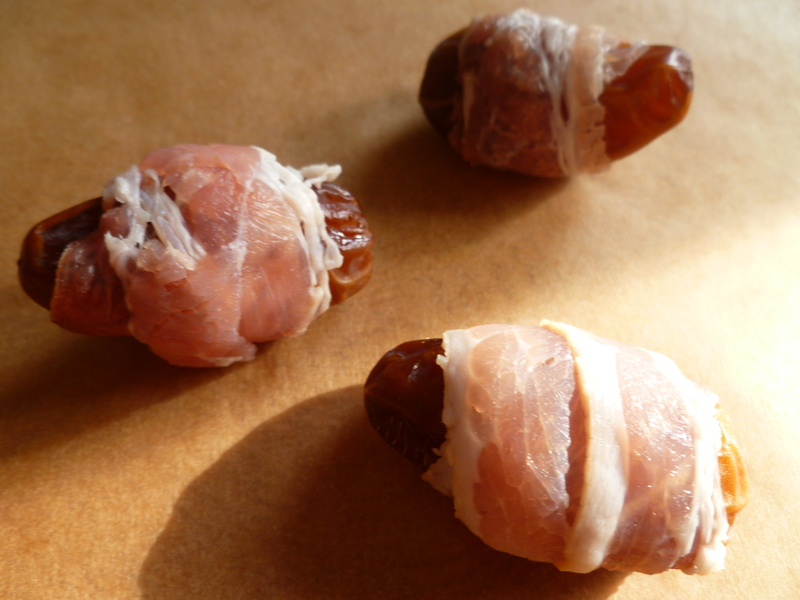 Serve the dates hot, with some small forks or toothpicks at the side to use for picking them up. 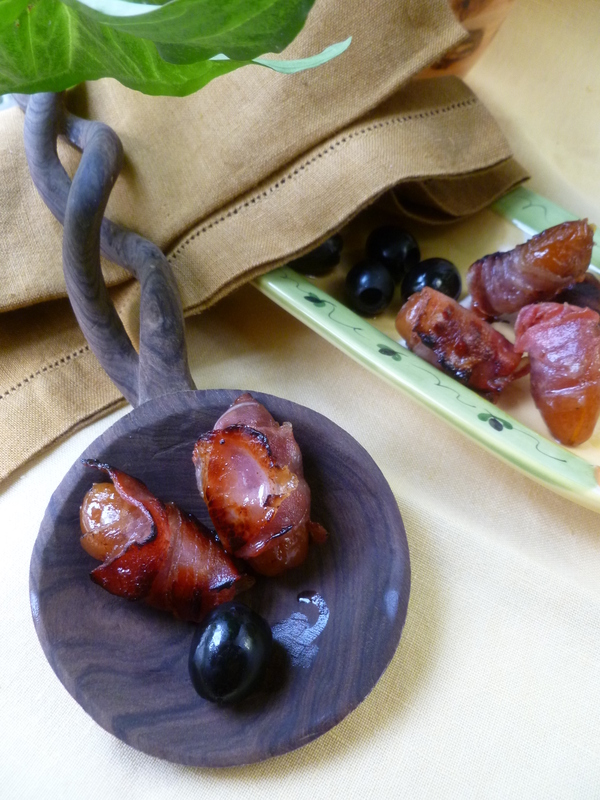 A Note: Bacon-wrapped Dates are an hors d’oeuvre in the Occasional Menu: Blunting the Keen Tooth of Winter: A Supper Party following an Out-of-doors Afternoon. These looks so delicious! 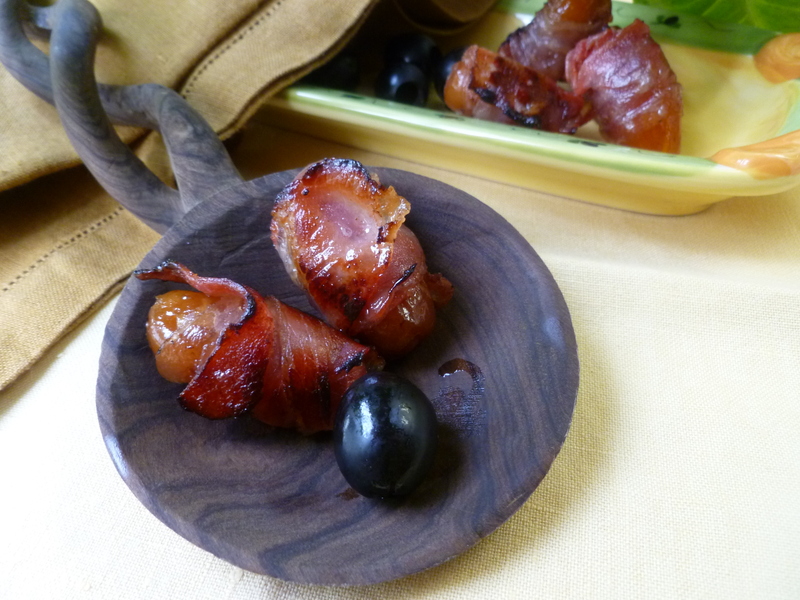 It sort of reminds me of one of my favorite appetizers, bacon wrapped artichokes. I haven’t blogged it because it’s almost too simple – the ingredient list is literally bacon and canned artichokes, drained and patted dry. But they look very elegant and they are so delicious. I definitely should try these dates though. The artichokes sound good, too. I will give them a go.